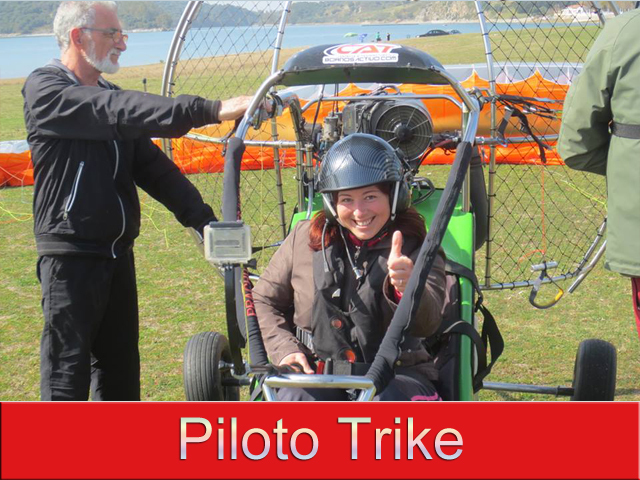 In what consists of flying in trike is easy to understand, in a short time the trike has solved many problems to many people who dreamed of flying in paramotor but the weight of the engine, the discomfort and the insecurity of the takeoff or landing career left Truncated that dream. With the trike anyone who wants to fly will be able to do it easily, with the trike disappearing age and physical barriers. Before, an elderly person, a person with physical disability or someone with little musculature, was vetoed to fly in paramotor. This apparatus consists of a small three-wheeled cart where the paramotor is placed and a comfortable seat where the pilot is attached, the complete assembly is easy to transport and to store. It's like having your own private plane in the garage of your house. With the Trike you can also. -	DURATION: From 6 to 8 days. -	Knowledge about the mechanics of trike. -	Gentle slope practices: take-offs, gliding flights and landings or trike flights with the instructor. -	Dexterity in handling with the trike on land without sail. -	Trike control and stationary motor sail. -	Control of the trike and the sail with motor on. -	Circuit flights on the flight field. -	Price: 850 € (All material included) Additional days 125 €.